Klondike Bluffs is located along the Northwestern boundary of Arches and hosts incredible views of the Salt Valley and a vast and unique formation known as the Marching Men. Klondike Bluffs is in the Northwestern region of the park. Seven towers make up the Marching Men Pillars formation. Tower Arch is 92 feet tall, 42 feet high, and 29 feet wide. 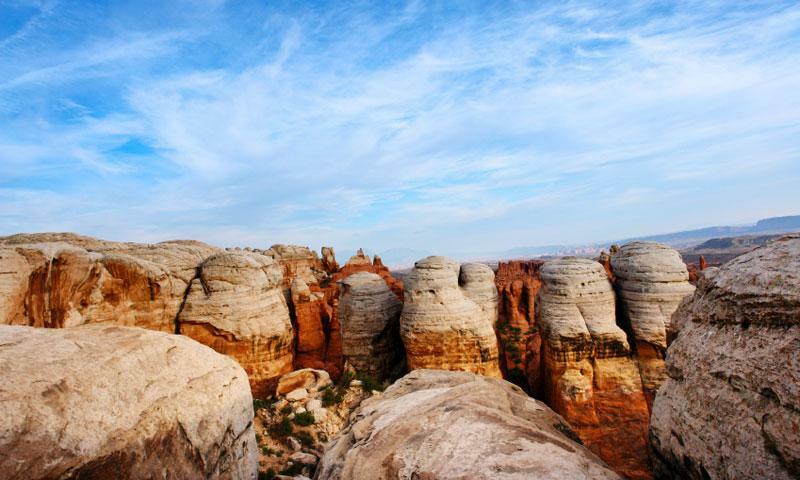 The hike to Tower Arch is 3 miles round trip. Klondike Bluffs Road is accessible by 4x4 vehicle. What are the Klondike Bluffs? The Klondike Bluffs area is a remote and seldom visited area of extreme climate changes in a wonderfully carved and weathered landscape along the Northwestern boundary of the park. Klondike Bluffs was shaped by a molten salt dome flowing beneath the earth's surface. Heat and pressure thickened the flow and caused the overlying rock to push upward, creating the crazy spectacle of sandstone formations. Turn onto Salt Valley Road 16 miles north of the park entrance. Follow Salt Valley 7.1 miles to a sign that says, Klondike Bluffs/Tower Arch, which will be on the left, turn on this road and continue 1.5 miles to Tower Arch Trailhead overlooking the Klondike Bluffs area. Klondike Bluffs can be accessed all year round, unless the roads are impassable due to snow or wet weather. Call the Arches National Park Visitor's Center for road and trail conditions at 435-719-2266. What can I do at the Bluffs? Just off the Salt Wash Road is 9.6 mile Klondike Bluffs Road. Slickrock, sand traps, and washboards make up the road, but when you arrive at the end, the hike to Klondike Bluffs is an easy 1/2 mile. Lined up like soldiers marching across the horizon, the seven Marching Men Pillars were carved by the elements out of sandstone and sit atop a ridge of slickrock overlooking the Salt Valley.Tower Arch spans 92 feet and has a height of 42 feet. It bears two different inscriptions on either base, one claims discovery in 1922 by the Ringhoeffer family and the other inscription by H.S. Bell named the arch "Minaret Bridge" in 1927. Look fore the dinosaur prints at Klondike Bluffs. The Klondike Bluffs region is largely considered to be the inspiration for the protection of the area as a National Monument in 1929.